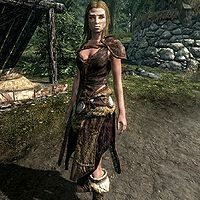 Hert is a Nord lumberjack that owns and runs the Half-Moon Mill with her husband Hern. She is exceedingly warm with her greetings to strangers, but shows some aggravation towards the war's effect on her mill and the high frequency of passing patrols. She will buy firewood, and will also sell lumber if Hearthfire is installed. If her disposition is raised high enough, she will allow you to cut your own lumber for free. Hert wakes up early at 7am and immediately starts chopping wood outside. After an hour of chopping wood she heads to the mill to work until 7pm, only having a small break to eat at 6pm. The remaining hours of the day she will spend just wandering around the mill until midnight, when she will have a last meal before going to bed. She wears a set of hide armor with matching boots. She also carries an iron dagger, a key to the millhouse and a selection of lower-class items and gold. Upon first greeting you, she will react quite surprised, "A guest, oh my!" She will follow this up with an offer, "Why don't you stay a while?" She doesn't seem to fond of the guards, although there aren't any to be found nearby, she will still tell you, "The patrols never seem to give us time to be alone, the nosy pests." If you should ask her which locations the mill supplies she will explain,"We supply Falkreath to the south. Until recently we supplied Helgen. Falkreath trades with the surrounding holds and without our wood they would have trouble keeping their prices low." You can also ask about her offer, asking if she gets many guests, "We have guests as often as we can but there aren't a lot of travellers these days. The war keeps people off the roads." During the related quest, Nazir will also mention her when he describes Hern to you, revealing that the two of them are actually vampires, "He's a vampire, and has blended into human society for years. He's never far from his female companion, Hert. Also a vampire. The contract is for the male, Hern. But you'll probably have to contend with the female, too. So for Sithis' sake, watch yourself." Once Hern is enabled, she gets a bit more dialogue and may now greet you with, "Hern and I do so adore guests! These guards are such a bore." You now also have the option to ask if she likes living so far away from everything, to which she will respond, "Other people just make things complex. Out here, Hern and I can get everything we need from the occasional traveler." Kill Hern: Kill Hern, a reclusive vampire. With the Dawnguard add-on installed, Hert's appearance changes so that she has glowing eyes and a more gaunt face. Even though Hert is a vampire herself, she will still become hostile towards you if you are a blood-starved vampire. Hert often complains about the local guards, even though there are none to be found. There does exist guard dialogue talking about Hert, however. Imperial guards would ask you, "Is Hert his sister or his wife? Or both?" While Stormcloak guards would be just as confused, "Hert keeps giving me this look. I don't know if she wants me or if she wants to eat me." Hert never loads any wood in the saw while working, she just stands in place. 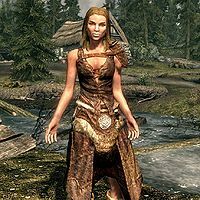 This issue has been addressed by version 3.0.5 of the Unofficial Skyrim Legendary Edition Patch; The ai marker was not placed close enough to the mill. Hert never sleeps because the only available bed is incorrectly owned by RiverwoodSvensHouseFaction. Neither Hern or Hert have any vampiric spells or abilities. This bug is fixed by version 3.0.7 of the Unofficial Skyrim Legendary Edition Patch.